In a world where the consumer is constantly bombarded with a myriad of brands, new products, adverts and flashy “look at me” promotions, it has become crucial for any business, whether they’re selling a service or product, to draw a line in the sand. To “draw a line in the sand” is to make a stand for something. To stand for something you need to have an opinion, a voice, and the guts to make it heard and live with the consequences – good or bad. Drawing a line in the sand also means doing things differently and making certain sacrifices. Once that line is drawn – it should influence the company from top to bottom – and obviously influence the service or product that is being delivered. That’s their line in the sand – and it defines their entire company from top to bottom. In August 2011 Chipotle launched a viral video on YouTube called “Back to the Start” (http://www.youtube.com/watch?v=aMfSGt6rHos) which is a simple, beautiful, stop motion animation that visually shows their “line in the sand” to the public. As I’m writing this – the video has been watched 6 639 796 times. Just think about that. This isn’t an advert on television or in printed form that is forced upon the consumer that they have to look at it because it’s there. The video has been watched 6.6 million times by willing viewers, who actively chose to watch the video and hear what Chipotle had to say. And it was created at a fraction of the cost of a normal above-the-line campaign. 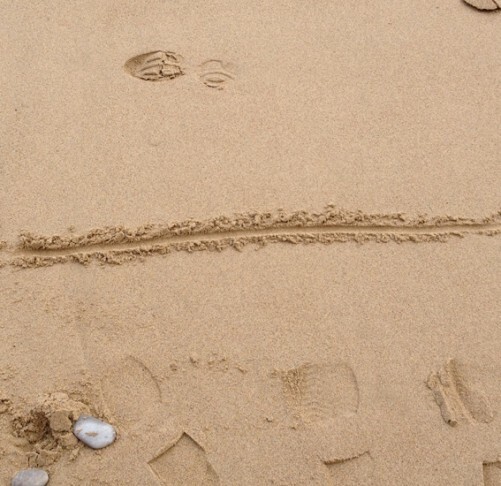 Drawing a line in the sand makes your brand more interesting. People will either love you or hate you. Isn’t that a far better response than everybody not caring and being indifferent towards your brand? A brand without a cause, without a stand, is just plain boring, and if you think the consumer cares – you’re wrong. At Contrast, our line in the sand is fairly simple, yet quite profound. We aim to create brands that are honest. In order to do this we believe that being straightforward and honest with our clients is key and proposing honest ideas that will really make a difference to a brand is integral to who we are. We believe in this so much that we will not, no matter how great the possible financial gain, sell something to our clients that we don’t 100% believe in. Because of this simple line in the sand – we have wonderful clients that adore us because they appreciate our honesty and openness. But, we’ve also lost clients because of our line in the sand. We’ve had clients who’ve wanted us to portray their brand in a way that would have been dishonest. That would not benefit their bottom line but was more about stroking their own ego and wanting to see their name in bright flashing lights – no matter what the cost. We just don’t work that way and we never will. Because of our line in the sand – big mainstream agencies dislike us. Why? Because we keep telling our clients there’s a better, more cost effective way to brand their products/services. We’ll never push a client to spend big just to enrich ourselves when there are better and more cost effective ways to communicate directly with their target market. I urge you to think about your brand. Are you making a stand for something? Do you have fans that adore you – or are people buying your product out of pure indifference just because it happens to be there at the time? The world doesn’t need another boring brand. Be different.